Willoughby’s Karl Quinney has been awarded the Midland Club Cricket Conference’s Halesowen Trophy for services to junior and youth cricket. It was presented to him last Friday at their annual dinner by John Barclay (ex-Sussex and MCC). 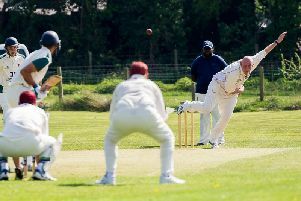 Karl joined Willoughby Cricket Club 25 years ago and has been their coach and youth cricket manager for 18 years. He has been responsible for the development of all levels of junior and youth cricket at the club, introducing Kwik Cricket and Under 11 teams alongside Under 13 and Under 15 teams. He has managed several different team sections during that time - in some cases three at once – seeing them from junior cricket into the senior level game and earning considerable respect from players and their families. Karl is now retiring from coaching and team management after seeing the last of those teams - which started together as eight-year-olds in Kwik Cricket - through to the end of their youth cricket last year. After two league wins and several cup final appearances together previously, the Under 15s’ unbeaten season in 2018 was the perfect script and ending. Last month they were also runners-up Young Team of the Year in Rugby Sports Awards. Karl says it has been a privilege to coach and manage at Willoughby, making many friends along the way and seeing some great cricketing talent both at WCC and at many other clubs. As well as his coaching activities, over the years Karl has also been fixture secretary, organised winter nets, and successfully applied for many grants to purchase new equipment for the club. He will still continue to play and continue to be Willoughby’s Press Officer, a role he has held for more than 20 years.